Reality show Bigg Boss season 11 has completed a month and these days there is nothing but only fights happening in the house. The last night's episode of the show saw the fight between the contestants over the same matter. It also saw the luxury budget task in which the contestants tend to cheat and lost their prize money which came down to zero. The final contestants who will fight for captaincy also got final. For those who missed the last night's episode of the reality show, check out the highlights in the form of 5 Catch points. 1. The fight between Benafsha and Akash continued. Also Luv got into a fight with Akash in the washroom for calling him dog. Later in the living area, Priyanka and Puneesh gets into a fight after which Puneesh spits on Priyank. 2. 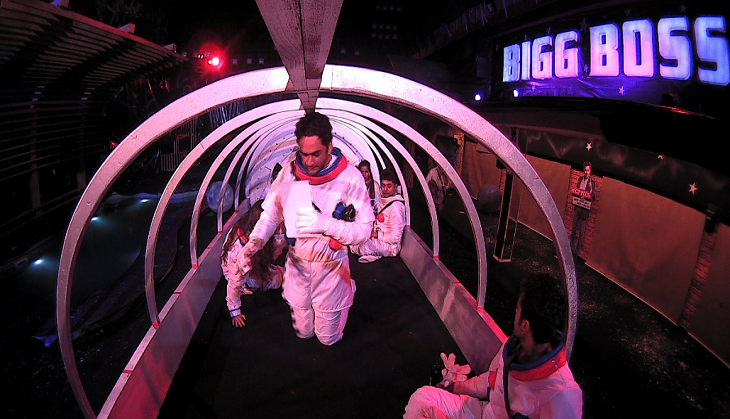 Bigg Boss announced the luxury budget task in which the contestants acted as astronauts and had to sit in the rocket for as long as they can. As soon as a contestants leaves the rocket, a certain amount associated with that contestant will get deducted from the prize money of the show which is 50 lakhs. Sabyasachi Satpathy gets down the first, cutting Rs. 70000 & making him eligible for captaincy. Tune in to #BB11 to see what happens next. 3. The contestants discuss who will first leave the rocket. The buzzer got played and Sabyasachi got out first after which Bandgi came out. Later, Bandgi and Puneesh were seen kissing and getting cozy under the blankets when noone was in the house.
.@lostboy54 just did the unexpected! Did you think he would do that? Tune in to #BB11 now. 4. Only Vikas, Hina, Benafsha, Sapna, Hiten and Luv were in the rocket and plans to relieve themselves by escaping the rocket while everyone else is asleep but Vikas planned to pee in the garbage bag that he had got from Puneesh. While every contestant got out from the rocket, Vikas pees in the garbage bag. 5. In the morning, Shilpa tells Puneesh that while he was sleeping someone from outside came to the washroom but he denies. Bigg Boss calls every contestant and declared that since everyone got out of the rocket, the game got over earlier and which is why their amount has been deducted to zero. Hina Khan was seen crying in the luggage room and regretting her plan.